Super Bowl Layered Dip, Jewish Style! 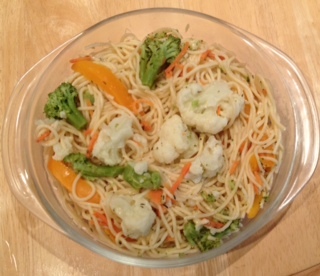 Here is a great “Noshable” (appetizer): I’ve taken two of my recipes (found on this website) and modified them to create this new and easy dish just in time for the Super Bowl! 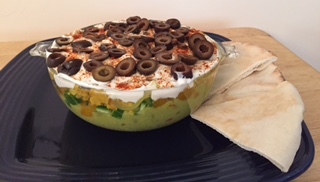 It has different layers and is best served with pita chips, tortilla chips, toasted pita bread or crackers.The layers can be made a day or two in advance and then assembled right before the game. Just remember that if you have people who keep Kosher, don’t serve this with a meat meal or if having a meat meal, substitute a non-dairy sour cream for the regular sour cream. Go teams! !